Understanding the global candidate pipeline through a study of motivations and behaviors conducted in partnership with IPSOS. In 2016, GMAC kicked off a global GME candidate segmentation study in partnership with IPSOS, a well-known market research firm, to help drive industry growth through insights on the motivations of the broader GME candidate pipeline. The study identified seven global segments that have distinct differences on what motivates them to pursue GME, including the desire to be a role model, provide for one’s children, develop skills and impact society. The marketing that can be developed based on motivations resonates more with customers than marketing that is developed based on demographics alone. It provides a way to connect on an emotional level and inspires action. Motivational segmentations are also universal, avoid cultural bias, and remain stable over time. Watch an aspirational story about each segment by clicking the characters below. 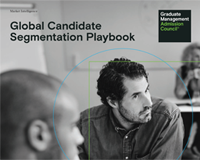 Data and insights to plan and execute program marketing campaigns informed by the GMAC global candidate segmentation model. 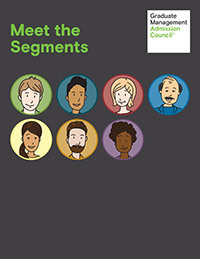 Findings of Global GME Candidate Segmentation study, outlines implications for business schools, and provides insights into how to effectively connect with each of the global candidate segments. 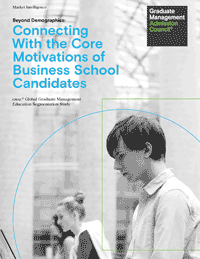 Meet the seven global segments of graduate management education (GME) candidates identified in our 2016 study, and learn about the distinct differences in what motivates them to pursue GME.